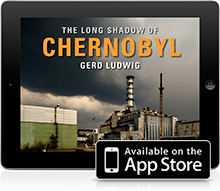 The Long Shadow of Chernobyl Funded! This is Brandon, Studio Manager for Gerd Ludwig. I just got off the phone with Gerd in the Chernobyl Exclusion Zone – he has no internet access, but was thrilled when I told him the final Kickstarter total: $23,316! Gerd asked me to pass-on his sincere gratitude for everyone’s help in sending him back into the Zone. He spent last week covering the construction of the New Safe Confinement and even went back into reactor #4 on his birthday. Today, he traveled just outside the Zone to follow the workers who continue to shore-up the existing sarcophagus. Due to the unfolding nuclear crisis in Japan, this project has become as timely and important as ever. While Gerd documents the aftermath of the Chernobyl disaster nearly 25 years later, he reminds us that the cost and consequences of nuclear energy will continue to develop for decades to come. Without your help, his return trip would not be possible. Again, thank you everyone for your generosity and support. We will keep you up to date through Kickstarter and the project website.